Plot: An eco-scientist is transformed into a mutant-monster with good intentions. Format: Duel edition DVD & bluray. Cast: Louis Jordan, Adrienne Barbeau, Ray Wise, David Hesse, Nicholas Worth, Don Knight. Despite the criticisms, Swamp Thing is the one thing we all need: late-night, comfort-viewing, brain candy. There are good films and bad films but, while the good films may tell us important things about life, the universe, and everything, they’re rarely the films that we rewatch. The bad films? Even the very bad films? Well, they seem to take in a life of their own. Branded cult, cheesy, or just plain daft, a bad film can often be the panacea for what ails you. 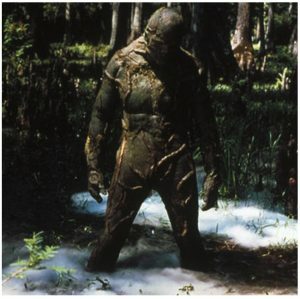 Swamp Thing is a bad film. Cult-film bad. Len Wein’s comic book original vision—transformed by Alan Moore into a monster who believes he’s a man—was a ground-breaking take on the superhero genre. Sadly the film makers clearly didn’t have the budget to translate Moore’s big ideas onto the big screen. Instead the avatar of The Green becomes a man in a saggy suit trying his best to deliver meaningless lines and make them sound deep. There are also some bizarre titillation scenes, seemingly thrown in at random—utterly vanilla, unsexy, and entirely out of keeping with a film that could otherwise pitch itself as a rainy-day family feature. A classy cast, including Louis Jourdan (Dracula) Adrienne Barbeau (Escape From New York), and Ray Wise (Twin Peaks) try their best to bring some gravitas and believability to the whole rambling mess. And while the film Swamp Thing is nothing like Moore’s creation, there’s enough of a spark here to make you wish that the director, Wes Craven, had had the time and the money to flex his creative muscles. The glorious, new DVD/blu-ray reissue won’t rock your world but it will be loved, watched, and rewatched by many because, for all for all these criticisms, Swamp Thing is the one thing we all need: late-night, comfort-viewing, brain candy.